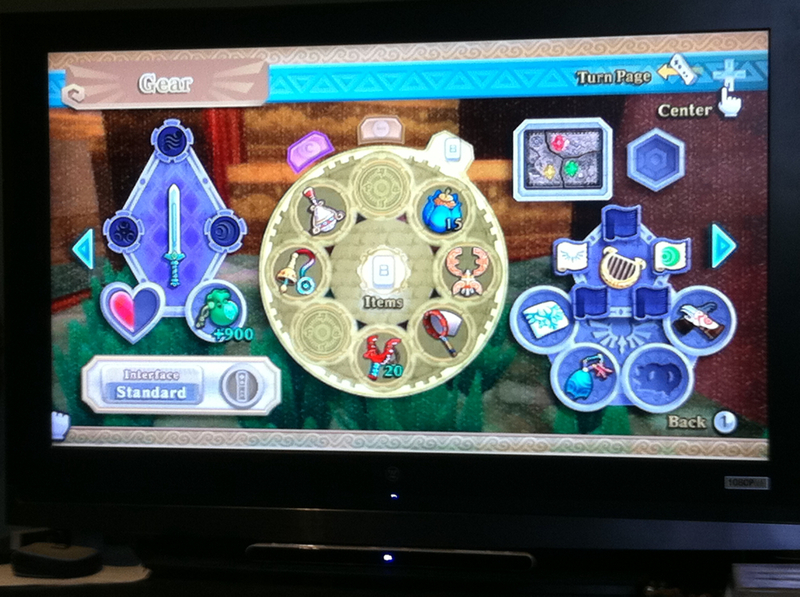 Ever wonder what pressing 1 on the Wii Remote does in Skyward Sword? If you’ve been paying attention to videos and screenshots, you’d know that it brings up the Gear menu. GameTrailers recently showed us this menu, pictured to the left. You can click the image to view a larger version. 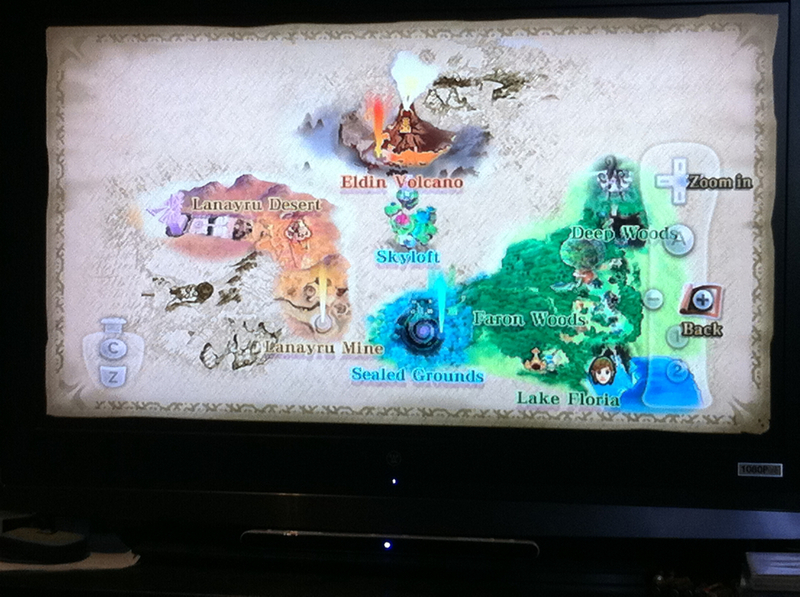 At the top right corner is an icon indicating how to center the Wii Motion Plus sensors (point the Wii Remote directly at the screen and press down on the d-pad), as well as another icon showing how to flip pages. One of these pages may be the collection screen, though I don’t know if there will be others. 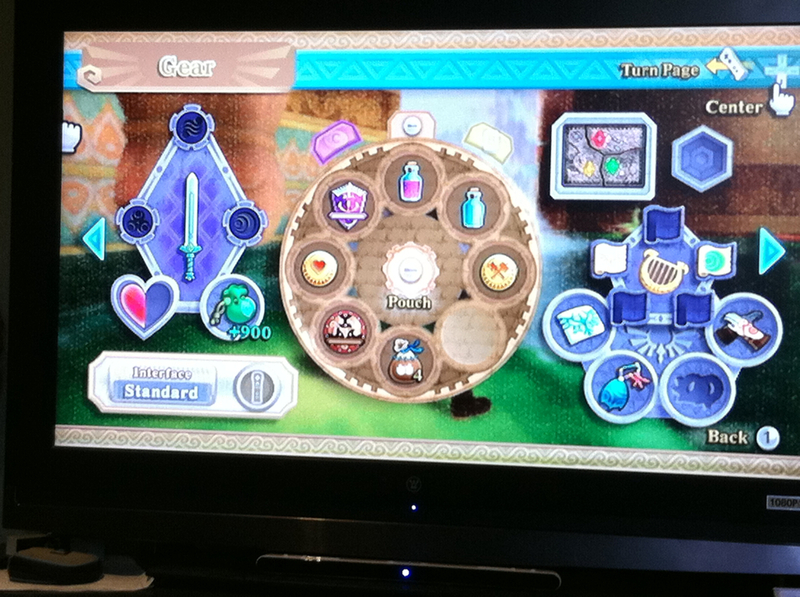 At the bottom is the option to change the HUD settings, along with another Wii Motion Plus calibration tool. The rest of GameTrailers’ menu is pretty empty, but some leaked images from 4Chan show what this menu looks like when you’re further along in the game. Hop inside for screens and analysis, but beware of spoilers. 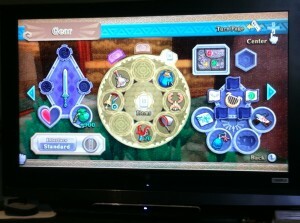 On the left, you can see how many heart pieces you have toward your next heart container and how many rupees you have. (Notably, you can get at least 900 this time, and there’s nothing to say that the wallet shown is fully upgraded.) The area above that shows quest progress for the second half of the game when you have to upgrade the Goddess Sword into the Master Sword. There’s one upgrade per Goddess. The right side shows even more quest items. The four at the bottom are items that Link uses automatically without pulling up a menu, including the Sailcloth, a scale for swimming, what look like some sort of bracelets (i.e. Goron Bracelets or Power Bracelets), and the Mogma Mitts. Above these is the harp, surrounded by the songs you’ll need to learn. One song is represented by the bird crest, another by Farore’s symbol. Presumably two more will have the remaining two Goddess symbols, and the final one is unknown. 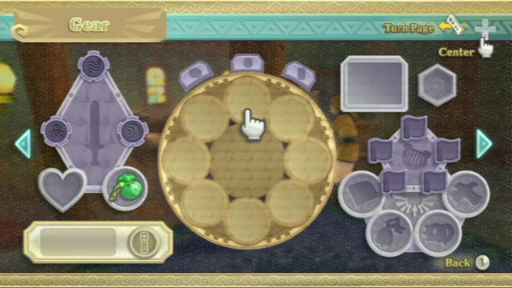 In the center, we see the familiar item inventory. These are the important tools that Link can access in real-time (outside this menu) with the B button. In this screenshot, the player has collected everything up through the Whip from Ancient Cistern. The Slingshot has also been upgraded to the Spreadshot, and the Beetle has been upgraded twice. The next screenshot shows that you can switch between three circles in the center of this screen. This circle is the Adventure Pouch, which can hold a wide variety of items. You can carry a Seed Pouch, Potions, up to two Shields, and medals that improve Link’s abilities. Any items that can’t fit in this pouch can be placed in a storage facility in Skyloft. You can access this inventory in real-time outside this screen with the minus button. The final tab, not pictured, is obviously the Dowsing inventory, judging by the purple color and the C-button label. This will display all of the objects and people your sword can help you find. Finally, there are two objects above the harp section. I have no idea what the hexagon is for, but the other is the completed tablet, each piece of which you need to acquire in order to land in each province. The first piece is given to you by Fi so you can land in the Sealed Grounds. It also happens to look like a map of the land below. Glowing marks on this map correspond to the initial landing zones and the beacons placed there. Of interest, there is a (relatively) large circle in the top-left corner, which if significant, is directly beneath the large cloud dome in the sky. This does not appear on the actual map, shown in the final image of the set.